EVOMOBILE is the University of Valencia electromobility living-lab. This initiative consists of a set of actions to create sustainable forms of travelling between the UV campuses. It aims to reduce the use of internal combustion vehicles regularly transporting between the different sites of the University (both people and goods), and to explore possible alternative models of sustainable transport solutions for the community users of the UV. The project includes the establishment of a recharge network for electric vehicles distributed around the three campuses (Blasco Ibañez, Tarongers and Burjassot-Paterna). • Assess the feasibility of this mode of transport. • Serve as a proof of concept of electric vehicles and the different technology associated to the charging points. • Evaluate the social impact of this sustainable way of transport. • Serve as a previous pilot experience for later be used in larger user communities. 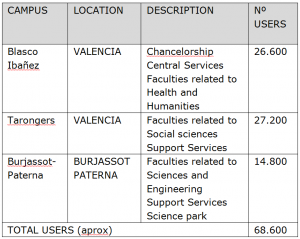 The scope of the project is limited to the community users of the UV and covers mobility between the faculties of Valencia, Paterna and Burjasot (a radius of 25 km). 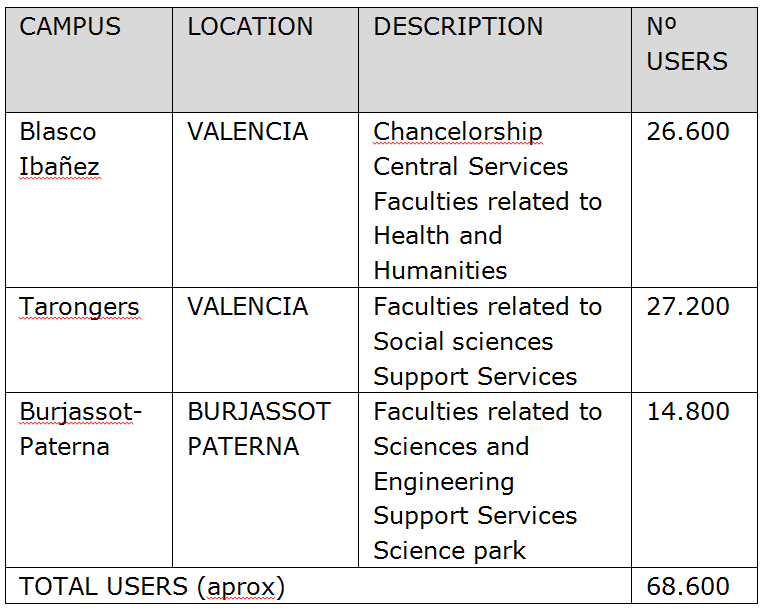 The main mobility problems identified within the UV are mainly based on the dispersion of the university community over three different campuses (Blasco Ibañez, Tarongers, Burjassot-Paterna). The conclusion of this experience is being analysed and will be used to identify specific groups of consumers that can serve as prescribers for a change in the general habits related to urban transport. The idea is to set up new business models in order to cover the market needs and provide solutions that stimulate a behaviour change amongst these specific consumer groups (prescribers) and catalyse the transition towards more sustainable displacements.